This morning I had a great school walk with Roz. Kris used to take her to school before, but I took over mostly because it means we all get to start the day together ( otherwise I’d be rolling out of bed at 11am and the day would already be gone), I get to see my big girl in the morning, and I get some exercise walking her to school. It’s usually a bit of a nightmare, culminating in her clinging to my legs saying she doesn’t want to go to school while I push her into the class getting embarrassed, angry, and just wanting to be gone. It’s been interesting. A bit hit and miss with some mornings having to nag her half to death. The getting dressed part is easy, I just dress her in her half awake-half asleep state, then hoist her out of her bunk bed and on to my hip, carrying her to wash her face. This is my favourite part because she nuzzles into my neck with her curly hair tickling my cheek. We don’t get those moments that much anymore, just me and her. She’s heavy and long legged and armed but I love carrying her the short distance from her bed to the bathroom. Then I wash her face and she’s a bit more awake, apply coconut oil to it and she’s fully awake and we’re chatting and deciding what to have for breakfast. It’s always weetabix. Always. I don’t know how she can have the same thing nearly seven days a week but hey, I ain’t her. But every single morning. And she’s very specific about how she wants it. The milk has to be heated in the microwave for thirty seconds only. Just to get the cold slightly out of it. Then she places the one and a half biscuit of wheat carefully into the milk, mashed it with her spooon to a gooey pulp and then, and only then, am I allowed to place a half teaspoon of honey into it for her to mix. And difference to this routine and she will not eat it because ‘it doesn’t taste right’. Gee. I wonder where she gets that from. Ahem. So I get that ready and it’s at this point that things go wild and out of my control. She wants to draw, or she wants to play with the baby, or something else catches her eye. While she has thirty minutes to finish her breakfast, it always takes a reminder or two to get her going. By seven fifty five I’m begging her to finish up as we have five minutes to brush teeth, shoes and coat on and out the door if we’re to make it to school on time. In reality we have up to ten past eight, (always build in some lag time) but I’m not going to tell her that. It’s the difference between a casual stroll and a brisk walk to school. Today we didn’t leave the house till ten past eight, so I knew I’d be anxious all the way to there. I don’t do well with being late. I get very anxious. Though I’ve gotten better with it over the years and try not to be so hard on myself about it. Keeping the big picture in mind helps. I’ll have to write another post on how I changed that, and it’s really interesting, so keep an eye out later this week. But this morning I just thought, ah well, so we’ll get there when they’re all lining up and she won’t have time to have a play wth her friends but she won’t be late. Now don’t get me wrong, I’m not this nice first thing in the morning, but kids make you think outside of yourself sometimes. Left to my own devices I’d have written nothing, or boo/cold innit/hope you bought de-icer etc so I’m kinda proud of myself that I kicked my nice side into gear so early in the morning. “Yes! I can draw love hearts and you can write ‘enjoy your day’. Yay’, says she. All the time squirming inside because I sooo did not want to touch it. “Well, gently throw it”, says me. Wonder where she gets that from too. She picked it up (and ohgoditwassquirmingthewholetimeargharghargh) and gently tossed it onto some earth beside the sidewalk while I jumped up and down and wriggled in silent disgust. I didn’t even notice I was doing that till two men standing a few feet away burst out laughing and teased me. I do not like worms. Shudder. 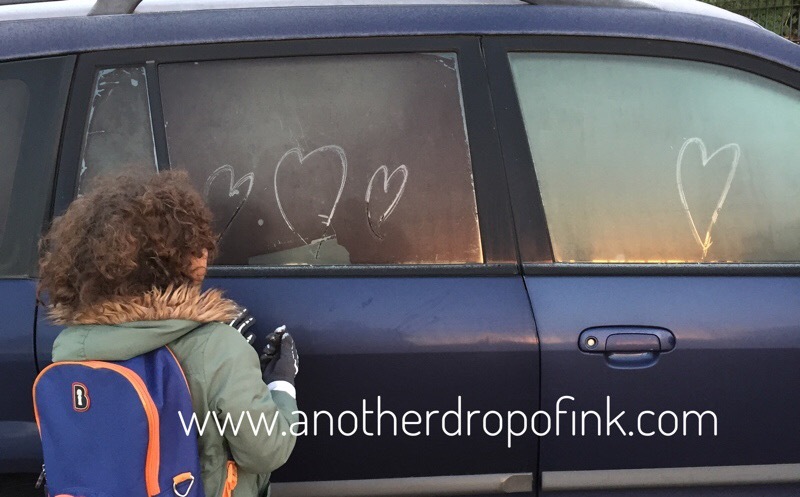 And so we had to run the final stretch to school, hands frozen and cheeks cold, laughing and talking about what the people would think about the cars, maybe they’d think it was Jack Frost or winter fairies or just a lovely kid and her mum. And as she slipped into the classroom, breathless, waving me goodbye, not clinging, not wailing, I was happy we had taken those extra ten minutes to do something fun. She wasn’t that late, in fact the kids were still hanging up their coats. Listen to that justification. You can hear the anxiety trying to slip out even there. But seriously, she wasn’t late late. Most important to me was the look on her face. She was so happy. I want to see her that happy every day. I want to be happy that way everyday. Even if happiness is fleeting, those moments when it does happen are amazing. I know it won’t be this way every day, but I’m happy that today, it did. It really is. The special moments in the everyday things. May you have many more such journeys together. Some day you will look back at this post and it will bring even more pleasure than the day you took this trip. Next story 9 reasons to see Moana: A movie review.